A Barnsley Historian's View: Sarah Butterfield - discovering my distant cousin lived in Grimethorpe in 1901 ! Sarah Butterfield - discovering my distant cousin lived in Grimethorpe in 1901 ! It will be obvious from the title of my blog that I live in Barnsley, but you may have wondered why I have a sailing ship on the header as well as an old view of our street. Many of my own ancestors, who were mostly from Sunderland, Newcastle, and parts of Cumbria were involved with ships and sailing in the 19th and early 20th centuries. So when I discovered a new mariner in my extended family yesterday my interest was caught straight away. It may take me more than one blog post to tell this story, so I'll start at the beginning. I had been contacted by a reader of one of my blog posts who is 'kind of' related to me via marriage. He had sent me some of his family information and hoped that it would be of use to me filling in a few more details about one of my family lines. Back in April 2013 I wrote two posts about the Batemans and the Butterfields who were originally from the Bradford area but who moved up to Durham for a time in the mid 19th century. One man, my 4x great grandfather William Bateman, stayed in Durham but the rest of his family seem to have drifted back to the Bradford and Huddersfield area over the following 20 years. William's niece, Sarah Butterfield, was born in Bradford in 1836. By the time the family moved up to Durham she already had one illegitimate son, William Henry Butterfield, also born in Bradford, and while living in North Bitchburn, Durham in 1859, she had a second child out of wedlock, John Thomas Butterfield. That makes him my second cousin four times removed. Remember him, he is important for the story of the connection to the new mariner! Sarah marries a William Fenton a few months later which suggests he could be John Thomas' father, or maybe just a chap who was kind enough to take on two step-sons and a wife of proven fertility. They have at least four more children together (see left) whose birthplaces seem to demonstrate the timeline and direction of Sarah's return to Yorkshire. Joseph Fenton was born in Crook in Durham (the same place my own grandfather was born in 1905 which isn't surprising as Grandad Hutton was descended from William Bateman) in around 1867. Herbert Enoch Fenton was born on the outskirts of Wakefield in 1870, and the last two children Priscilla and Ernest were born in Gildersome, which lies between Leeds and Bradford. Oddly the census returns tell a slightly different story. In 1861 Sarah, although listed under her married name of Fenton, is living with her parents in Gildersome! Her two illegitimate sons are listed as the grandsons of Miles Butterfield, the head of the household and Sarah's father. In 1871 Sarah and William Fenton are back together along with William, John, Joseph and Herbert, who are all listed as William's sons. To my surprise the family is in Royston, just a few miles from Barnsley! William Fenton is a coal miner and the two older boys are both 'Labourer in coal mine'. Somewhere along the line Sarah has returned to Durham, met up with William Fenton again and has their eldest son in Crook nearly seven years after their marriage. Then the family move down to Yorkshire together. I double checked on the new GRO online birth indexes which give mother's maiden name right back to the start of registration in 1837, but I can find no children born to the couple (I searched on Fenton, mmn Butterfield from 1858 to 1870) before Joseph in the third quarter of 1866. I can't imagine what was going on, it seems very strange to marry someone in 1859 and live apart for six or seven years ... maybe Sarah was just visiting her parents in 1861, but if that was the case why no children with William until 1866, it's not as if Sarah had any problem getting pregnant as far as we can tell! Herbert Fenton was registered in the Hemsworth Registration District in 1870, which I expected, as his place of birth generally given as Nostell or Walton in Yorkshire. Priscilla Cassandra Emily (!) is registered in Bramley in 1873, this is the RD which covers Gildersome. Ernest is registered in Wakefield in 1876. I did have to tweek the dates on my family tree once I had confirmed these births as calculating the children's ages from the census returns had given me dates a year or so out. As I had expected from what I already knew of the Butterfield family I can find no baptisms and only a couple of marriages for any of Sarah's children on Ancestry in the West Yorkshire Parish Records. The Butterfields tended towards Non-Conformity in their worship and few of those vital records are available online yet. I was even more surprised at the address for the family in the 1881 census, the one with the slightly misleading ages for the children shown above. They are living at Crosby Villas, Crosscannonby, near Cockermouth in Cumberland, which has taken us back to another area from which a branch of my own family originate. This is about 150 miles from their last address in Royston, near Barnsley. William Fenton is still a Coal Miner, it says 'Do' for ditto here and I've cut off the family above, sorry. Sarah's two older sons are no longer living with them. I knew that William Henry Butterfield had married in 1873 and that by 1881 he had at least two children with Elizabeth (nee Abbott). When I searched for them in the census I found Elizabeth with the children in Gildersome living at the same address as a lady I assume is her widowed mother, Sarah Abbott aged 45. William is not at home and I can't find him in the 1881 census at all. William and Elizabeth don't have another child together until late 1884 in Leeds which does make me a little suspicious, but in 1891 the family is all together again living in Hunslet, just south of Leeds. Sadly following the births of three more children, making eight in total, Elizabeth dies in 1898. The siblings are living together without parents in 1901, with sister Florence as the head of the household. William has vanished again but turns up in 1905 when he is buried at Gildersome alongside his wife. Meanwhile Sarah Fenton (nee Butterfield) is having her own turn of bad luck as William Fenton dies somewhere between 1881 and 1891. She is living in Morley, near Leeds in 1891 as a widow with her three younger children, Herbert, Priscilla (who is now going by Emily) and Ernest. She has a Grocery and Confectionery shop, maybe at home, 16 Albert Road, and all three children are working and no doubt contributing money to the family income. I do like the idea of a little shop, I guess there might be some way of finding out how long she had the business, maybe from the Electoral Rolls or the rate books. But I'd have to go to Morley to find out which might be a bit far for me these days. By 1901 Sarah has moved again and here is where she gets really local to me. She and a 12 year old grand-daughter, Ethel Butterfield, one of William Henry's brood, are living at Turners Row in Grimethorpe. This appears to have been next to the Grimethorpe Hotel (sadly now demolished) in the centre of the village. They also have four lodgers living with them, all coal miners, reflecting the new development of the area as collieries were sunk. 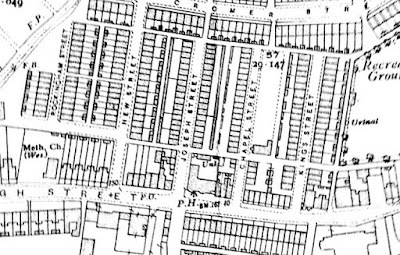 According to the blurb on the back of my copy of the 1929 Alan Godfrey map of Grimethorpe in 1901 the village was so new that three of the six streets were only known as 'One Street', 'Two Street' and 'Three Street'. 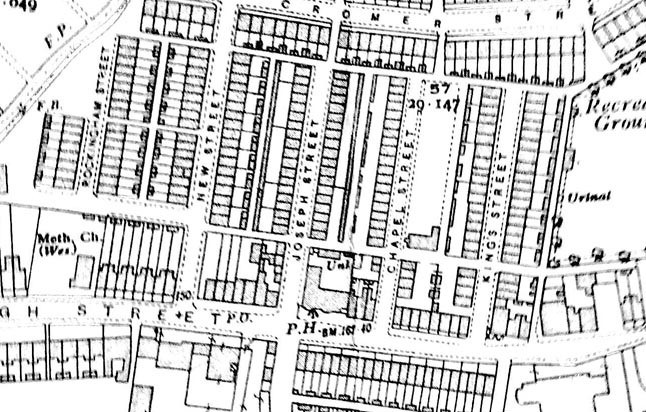 The census runs from Joseph Street, past the Post Office and the Grimethorpe Hotel into Turners Row which runs for four pages before turning into Freeman's Square. Maybe someone more local than me can place the address more precisely? By 1929 the village was apparently four times the size and on my map I can see the new estates to the north and south of the area shown above. Sarah's Fenton children have married by now, but most of the family seems to like to live near her and each other. In 1891 her eldest son Joseph, who married an Irish girl called Rosina in Cumberland in 1888, was living with his wife in Aspatria about five miles from where his parents had lived in 1881. However by 1901 the pair and their five children have moved to Kinsley, just north of Hemsworth, just five miles from his mum in Grimethorpe. Judging by the birthplaces of their children they passed through Morley along the way. Herbert Enoch Fenton married Sarah Annie in 1900 somewhere in the Dewsbury area and is living on Shaftsbury Terrace in Hemsworth in 1901, half a mile nearer his mum than his brother! Priscilla or Emily married Percy Lumsden in 1893 in Morley in one of the few Church of England ceremonies the family seem to partake in. From the looks of the links on Ancestry Percy and Priscilla emigrate to New Zealand - sadly I only have a UK subscription so I can't look those records up. Finally Ernest who married Jane in Morley in 1898 is living in Manston near Leeds in 1901 but has moved to ... [de de, de duh! 'fanfare'] ... Grimethorpe by 1911! In the most recent census we can access, 1911, now aged 75, my cousin Sarah, having enjoyed a brief marriage with a gentleman called Edwin Bashforth between October 1901 and his death in the second quarter of 1910, is living with her son Herbert in South Elmsall. He is a Fish and Potato Fryer working on his own account at 207 Dearne Street. He is sufficiently well off to have a domestic servant living in. Sarah dies on 25 February 1915 at Westfield Road, Hemsworth aged 78. I was able to find her burial record on the Wakefield Council's brilliant website. It might not be fully indexed but it is completely free! There must be Fentons still around here who are descended from Sarah and her children. They will be my very distant cousins, what a strange thought! One of Herbert's children, Clement Enoch Fenton, aged seven in the 1911 census, was even born in Cudworth where we now live. It's a very, very small world. Oh, and if you were wondering what had happened to John Thomas Butterfield, whom we left in 1871 in Royston, you'll have to wait for my next post, this one is quite long enough for now.